Check out Senen Llanos' fantastic portraiture of cosplayers at this years New York Comicon. Some impressively made and worn costumes from the worlds of comics, anime, manga, video games, film and pop culture. 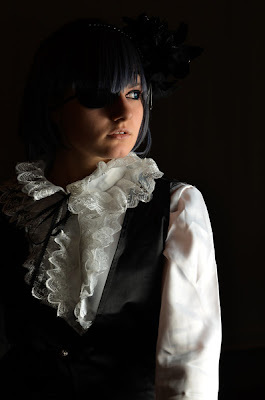 Ciel wasn't the only Black Butler character in the portraits; scroll through to see a very impressive Sebastian. Also worthy of note: an awesome Alucard from Van Helsing. These folks may have spent $1000 worth of time (and maybe even a lot of cash) on their cosplay gear, but I still respect their singular efforts to impress. Much more impressive to me than that ready-to-wear Akira jacket. These are some talented fans! And Llanos is one talented photographer as well. I love how he isolated the images from the busy backgrounds of the convention floors in order to highlight the characters, and the people who play them.